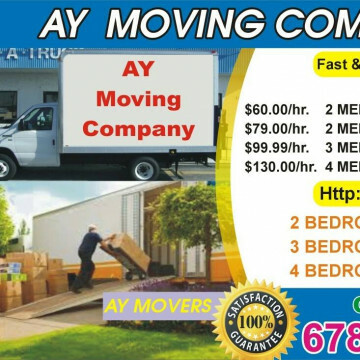 Ay Moving Company of Atlanta Georgia is a family-owned full-service moving company which has been serving the city of Atlanta and the wider Atlanta metro area with moving labor assistance for over fifteen years. Providing both local and long-distance moving services, Ay Moving Company of Atlanta is prepared to assist with each step of the moving process from packing to delivery and everything in-between. Specific services provided by Ay Moving Company include appliance moving, piano transportation, and furniture moving along with providing packaging supplies such as tape, cardboard boxes, packing boxes, dish boxes, and bubble wrap. Ay Moving Company offers comprehensive plans to cover every aspect of both residential moves and commercial relocation in which they assist with packing, loading, transportation, and unloading. Ay Moving Company owns climate controlled storage facilities which can be used for short or long-term storage of furniture or any other personal belongings that can’t immediately be moved to a new location. What will my move cost?